Beaducation: The Blog: Over 100 items at up to 40% off! Over 100 items at up to 40% off! Beaducation's BLOWOUT SALE has just begun! Lisa had a huge dose of holiday cheer in her eggnog this year and decided to put over 100 items on special at 20-40% off! There is such a variety that surely you'll find something you need. 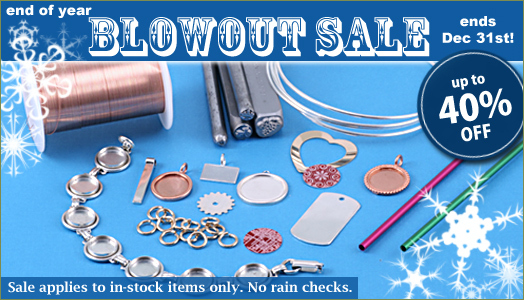 We have Sterling Silver Blanks, Anodized Aluminum Tubing, Wire, Letter Sets, Design Stamps, Artisan Copper Blanks and more! A few of my favorite items are our trusty Plastic Mallet, the Beaducation Uppercase Script Letter Stamp Set, our Medium Copper Circle Pendant with Dotted Edge and our 24g Silver Filled Wire. Be sure to check out the other 100 plus products on sale because it all ends at midnight on December 31st! Restock your arsenal of supplies before the 2012 apple drops!